“Healthcare ~ GOD’s Way” from Christian Faith Publishing author Dr. Terry M. Reed is a study of the medical profession and the benefits of natural medicine, while looking into God’s role in the process. “Healthcare ~ GOD’s Way”: takes a hard look in the body and the practice of healing keeping in mind the role of the Creator. “Healthcare ~ GOD’s Way” is the creation of published author, Dr. Terry M. Reed, who holds doctors in Naturopathy and in Naturopathy Ministry. The author has pastored a home church for 13 years, and has owned and operated two naturopathy Clinics for 13 years. Published by Christian Faith Publishing, Dr. Terry M. Reed’s new book is an examination of medicine, the body and the Creator’s role in all of it. Comparing the natural health and medical communities Dr. Reed seeks to create a better understanding of how these fields operate. Dr. Reed seeks to enlighten readers as to the value of naturopathy and the creator’s role in healing. By understanding how body and soul interact with the world around it Dr. Reed can help readers identify what makes them sick and how to possibly stop it. View a synopsis of “Healthcare ~ GOD’s Way” on YouTube. 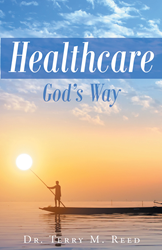 Consumers can purchase “Healthcare ~ GOD’s Way” at traditional brick & mortar bookstores, or online at Amazon.com, Apple iTunes store, Kobo or Barnes and Noble. For additional information or inquiries about “Healthcare ~ GOD’s Way”, contact the Christian Faith Publishing media department at 866-554-0919.